Keeping this one short: One day I wanted some of my Sweet Potato Brownie Bites, but seriously did not want to spend the time putting tablespoons of brownie batter into my mini muffin tin mold. Then the light bulb came on. An idea struck me. 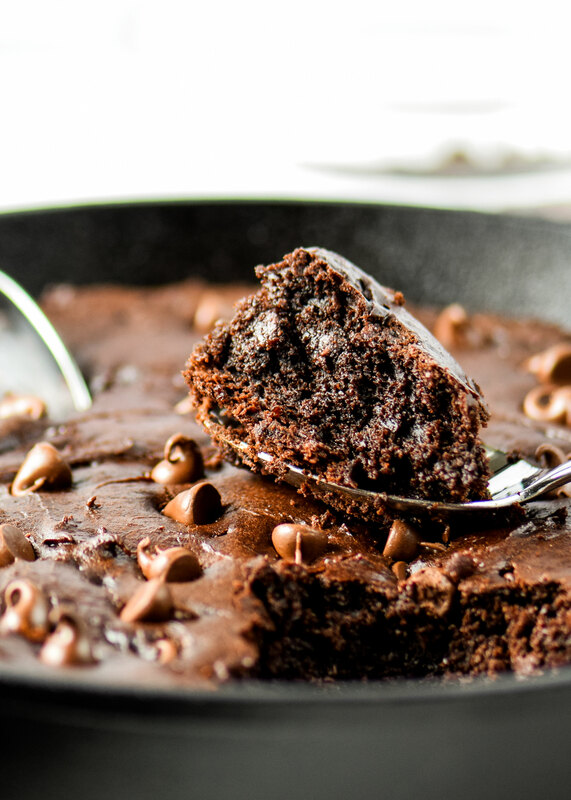 BROWNIE SKILLET. So this babe was born!! Less hands on time than the original brownie bites I mentioned above, modified a bit since there is zero portion control, but still just as freezer friendly, and oh so delicious. A 10 inch (or close) cast-iron skillet – I use this 10 inch one (affiliate link!) made by Lodge. The price is reasonable, and this brand can be found online or in stores (I’ve seen this at Target!). I have not tested it, but I do think any non-stick oven-safe skillet of the appropriate size would work. 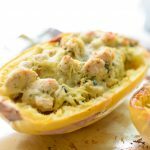 A sweet potato – Medium to large is best, the one I used for these photos was 12 ounces. Bake and then peel the sweet potato to start making your own pureé. A blender, food processor, or potato masher – For this recipe, you’ll have to make your own sweet potato pureé. 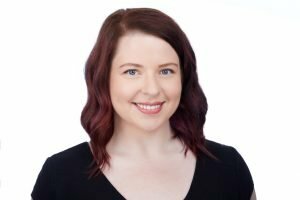 I use my Nutribullet High Speed Blender (affiliate link!) to do this. After making my pureé, I also add the other wet ingredients to the Nutribullet to blend them up with the sweet potato. This is not required, but it saves you a bit of mixing. Hand mashing will work, but any chunks of sweet potato may be visible in your brownies. Milk – I used unsweetened vanilla almond milk, but any will work. 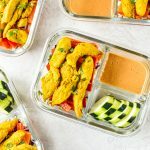 Nut Butter – I used peanut butter, but any nut butters such as almond butter or cashew butter will work for this recipe. Chocolate – Cocoa powder, chocolate chips, you know, the goods! Normal baking ingredients – Vanilla, one egg, flour, sugar, baking soda, salt, the normal stuff. Espresso Powder – Really kicks up the chocolatey flavor to another level. I don’t make chocolate baked goods without it! Technically this is optional, but I highly recommend it! How do you make sweet potato pureé? First, you’ll have to bake, or otherwise cook your sweet potato all the way through. I do this in the oven at 400F for 45-60 minutes, depending on the thickness of the sweet potato. 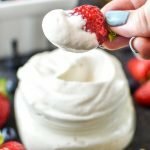 You should be able to pierce the sweet *very* easily with a fork. Let it cool for a few, then peel the sweet potato and add it in chunks to your blender, food processor, or bowl to mash. *Consistency will vary depending on your pureéing method, but all will work methods will work in the brownies! * As long as your potato is fully cooked, you should be able to make a nuce pureé with any method. Add milk (I used unsweetened vanilla almond milk) by the tablespoon if your sweet potato is not blending. I usually add 3-4 TB of milk, depending on the size of my sweet potato. 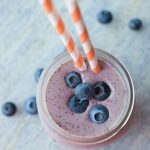 I use my Nutribullet High Speed Blender (affiliate link!) to make my pureé out of the one baked sweet potato. 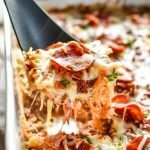 How do you make the Sweet Potato Brownie Skillet? Start by cooking your sweet potato and making your sweet potato pureé as described above. 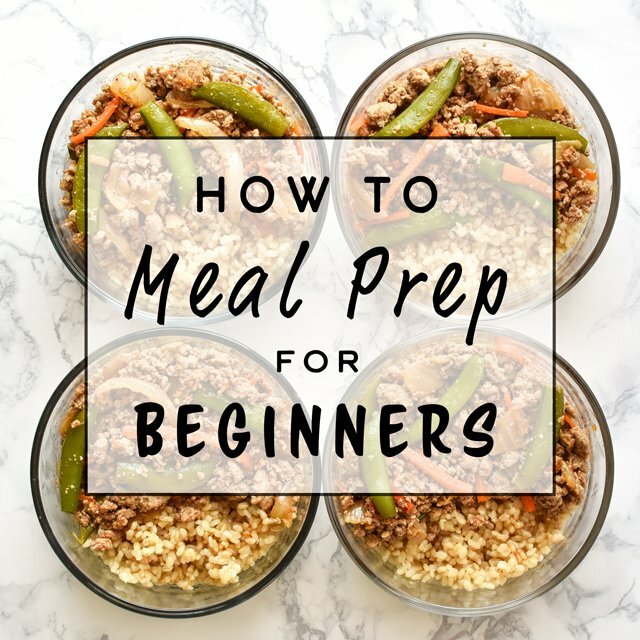 These are steps that can also be done ahead of time, or you can use leftover sweet potato, as long as you have around 12 ounces. The wet ingredients are pictured below in the bowl with the dry ingredients – wet ingredients includes the sweet potato pureé, nut butter, egg, and vanilla. Mix the wet with the dry, then add the chocolate chips. Once your batter is made, oil your cast iron skillet with avocado or olive oil. I just add a teaspoon or so and rub it around the skillet with a paper towel. Pour out the batter in your skillet and use a spatula to spread it around. Don’t forget to top with chocolate chips, duh! Bake in a preheated 325F oven for about 40 minutes, or until a toothpick comes out clean. Top with ice cream (I totally missed an opportunity to purchase, photograph, and eat ice cream here!! ), and enjoy!! 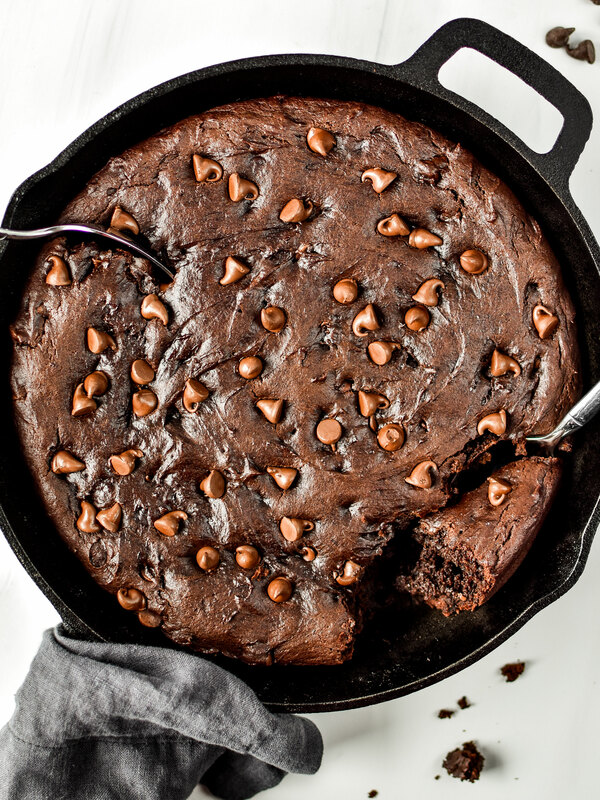 How long can you store this Sweet Potato Brownie Skillet? 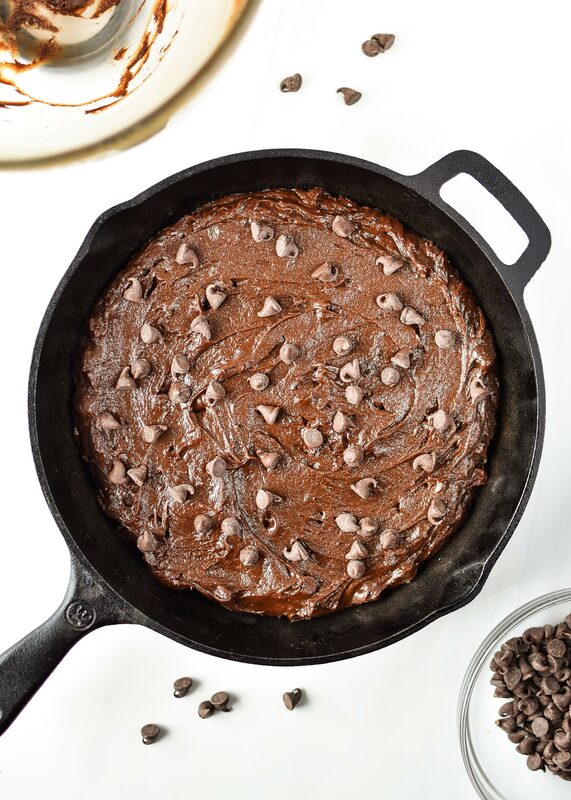 On the counter – Store this sweet potato brownie skillet on the counter in an airtight container for up to 4 days. I bet it won’t last that long! 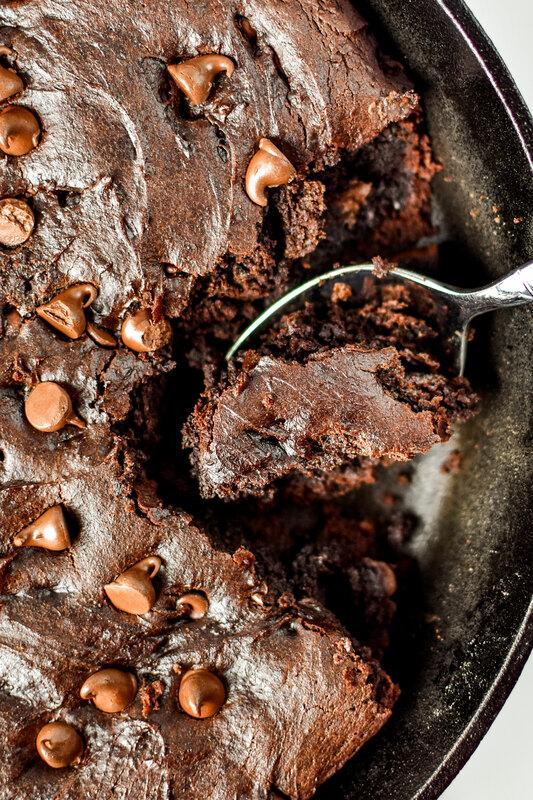 In the freezer – Store this sweet potato brownie skillet in the freezer for up to 3 months. 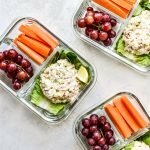 Cut into servings and store completely wrapped and/or in an airtight container. Almond or cashew butter: Yes! An oven-safe non-stick skillet: Yes! Leave a comment with more “Can I use” questions, and I’ll do my best to answer! Rich, chocolatey, indulgent, and you’d almost never guess there’s a whole sweet potato baked right inside! 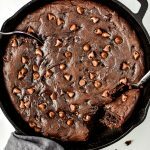 Use your 10 inch cast iron skillet to make this delicious Sweet Potato Brownie Skillet to share with the whole family. Grab a spoon and dig in! Preheat oven to 400 degrees F. Line a small baking sheet with aluminum foil. Use a fork to poke holes in the sweet potato in 4 or 5 spots. Once preheated, bake the sweet potato on the baking sheet for 45-55 minutes, or until you see the juices start to emerge from the poked holes. A fork should easily be able to pierce through the sweet potato. Let the sweet potato cool until easy to handle. Lower the oven temperature to 325 degrees F.
Peel the sweet potato and discard skin. Add sweet potato chunks and 3 tablespoons milk of choice to high speed blender or food processor and blend. If the sweet potato is chunky after blending, add an additional tablespoon of milk. Blend until completely smooth. 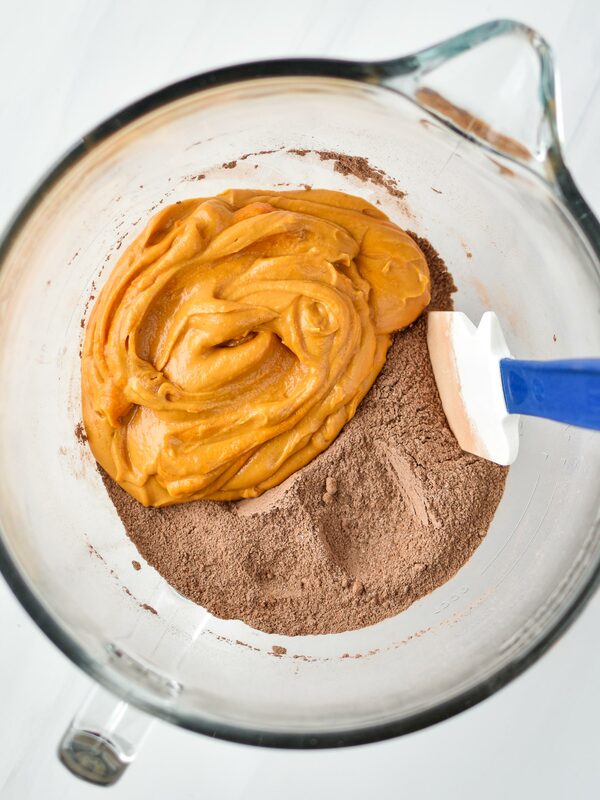 Add the wet ingredients (peanut butter, vanilla, egg) to the blender with sweet potato pureé and blend again. Mix until smooth and combined. 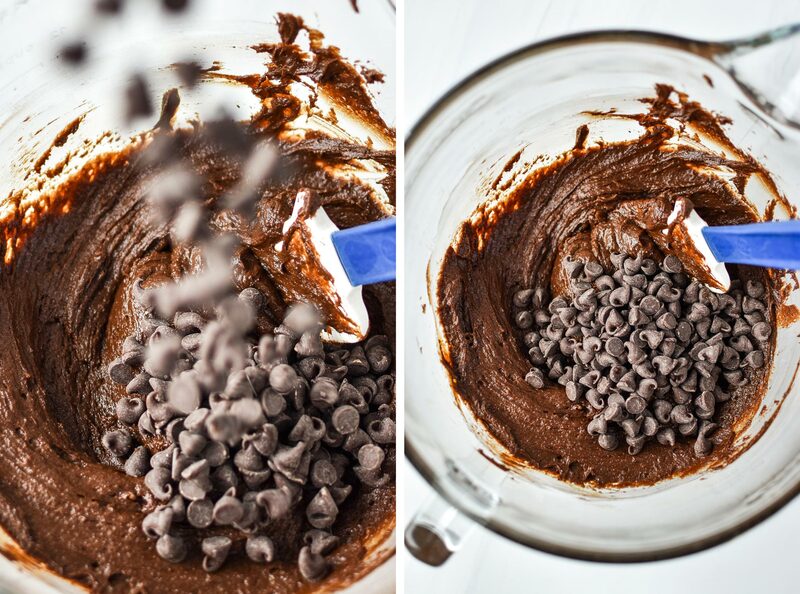 In a large bowl, whisk all dry ingredients except chocolate chips together. Add the wet ingredients to the dry ingredients and combine. Add chocolate chips (save a few for topping) and mix until combined. Add a teaspoon or so of avocado oil or olive oil to a 10 inch cast iron skillet and use a paper towel to rub the oil around the bottom and sides of the skillet. 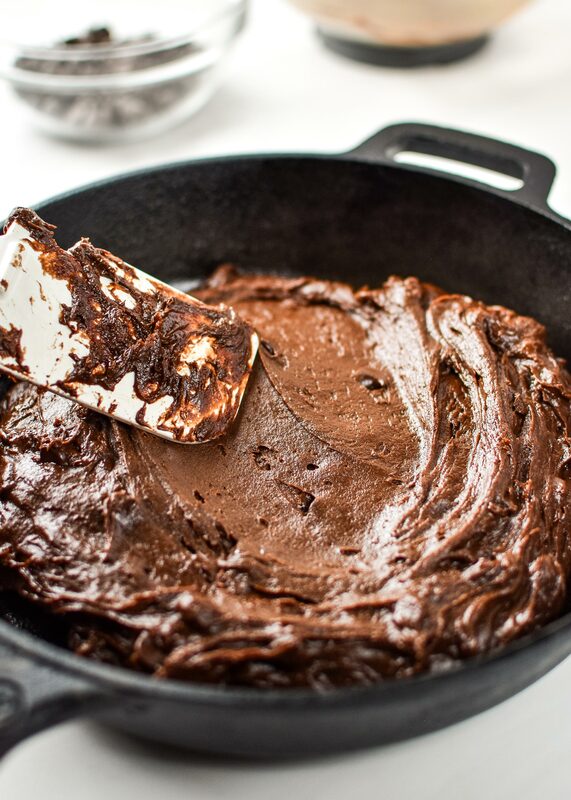 Add the brownie batter to the skillet and use a spatula to spread it out into a even layer. Sprinkle with chocolate chips. Bake in the preheated 325 degrees F oven for 35-40 minutes or until a toothpick inserted in the center comes out clean. Let cool for 5 minutes and then serve. Based on the recipe for these Sweet Potato Brownie Bites. Nutrition information estimated with My Fitness Pal. 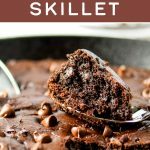 Show me your skillet brownies! I want to see that rich and fudgy goodness! 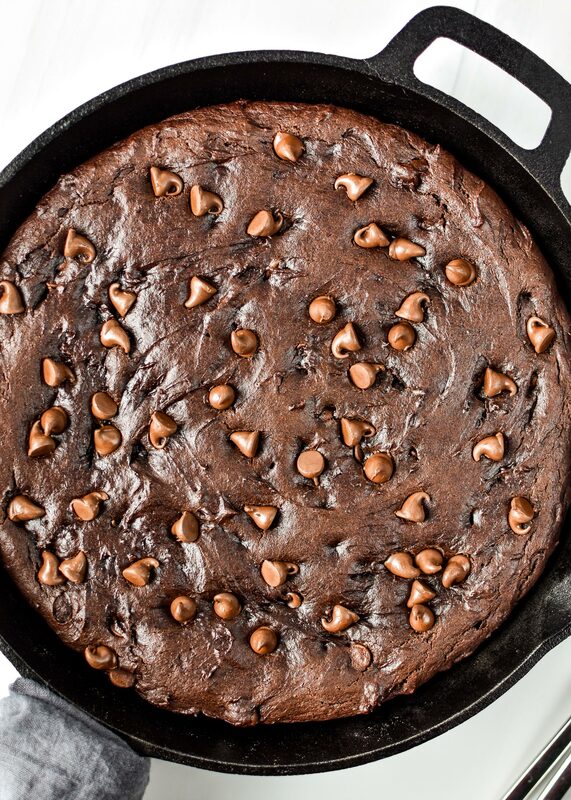 Share your Sweet Potato Skillet Brownie with me by tagging @projectmealplan or using that hashtag #projectmealplan. I’ll find what you made and give you a huge thumbs up! !